In short : Go to http://draft.blogger.com/switch-profile.g and do the necessary changes. Make sure to read all the caveats on the page. SEE ALSO: Facebook's technical clairvoyance. So what will happen if I enable the post? My profile will start looking what is on the right of the image below, unlike what you see now: that is on the left of the image. Google lists the below two. 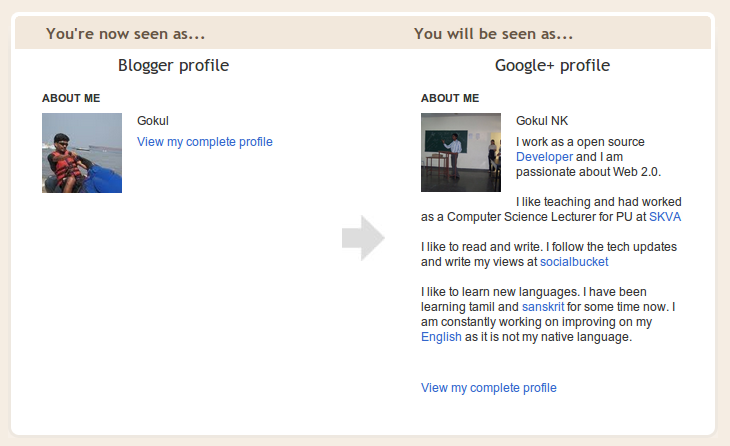 Upon switching to your Google+ profile, you will have the option of reverting back to your Blogger profile for 30 days. After that, your Blogger profile data will be deleted. Information on your Blogger profile won't be transferred to your Google+ profile, so copy your Blogger profile information to your Google+ profile before switching. But what about the real life scenarios? When you are maintaining more than one blog, you may prefer to have different biographies for different blogs. However even the current blogger profiles don't allow it :P Or do they allow? If true leave a comment how to enable it. I will switch back. Why should I enable this feature ? Google is selling the idea of Identity big time now. Though they have their own perks for doing it, it can be advantageous to the end users like us too. Highlight your posts in Google search results for your social connections : So what this means is : When a friend of yours(anybody in your circles) is trying to search for anything, post written by you will get a preference over others in the google results. Google author tag is not popular yet, but as it gets popular having a unique identity on google helps as others will start using the tag to display that you are author of some piece of work and that greatly enhances the chances of your articles turning up in searched that include your name. It can also add a slew of followers to your Google+ account, who were actually looking for just some content written by you. Remember Google is gonna make adding the authors from google search to the your circles, one click process. Get access to upcoming Google+ features on Blogger : This is the list important according to me. But it will be good to have the similar interface on both Google+ and blogger. And more over we can see the new features of Google+ on blogger which is nice. If you are a Apple phone-boy, I am sure you have already started bragging to your friends about the Siri : your personal assistant on your iPhone. But its time to get over Siri. Come Iris, now your Android friends can brag about Iris. Yet it is Siri read backwards and with similar features. 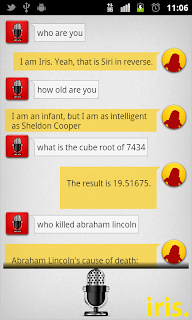 Albeit it seems to be much more intelligent than your Siri. "Quickly, I created a decent layout and design, and we added all shiny little things to iris, and what came out was a really good app (for an 8 hours effort that is). When we posted the first screenshot, we got a nice feedback from people around, and that is when we realized that this is something people are going to be excited about. ", Narayan Babu of Dextera wrote on his company blog. Coming from dexetra who have been working on heuristics for around an year, Iris is naturally expected to make Siri look like an amateur in long term. 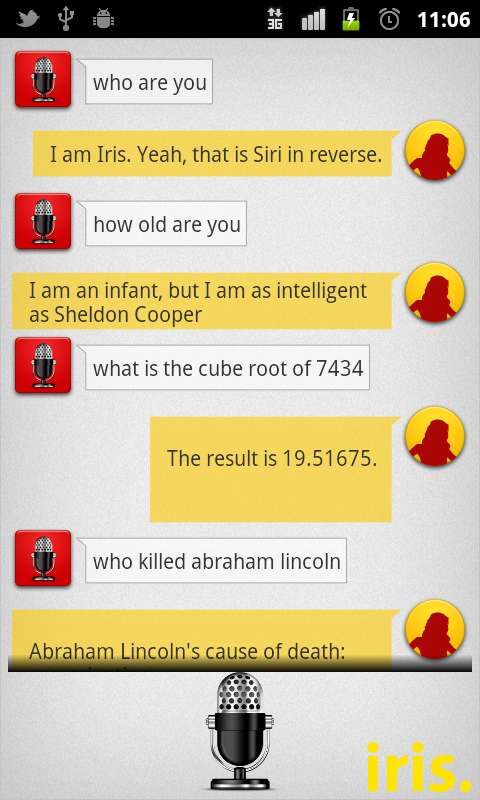 Be cautioned the App is still in Alpha phase and hence you might get some weird answer. But be happy as answers will only get better with time. I have already started liking Iris, just by watching this video. I am off to downloading the app. More reviews later. Google buzz has been a failure, and everybody knows it now. But what we don't know is that Google Buzz was more valuable to Google, than many other successful products that Google has come out with. These are the few lessons Google learnt from Google Buzz. People take Privacy seriously. Remember even after fixing all its privacy issue, Google Buzz has kind of become a synonym for Privacy Issues. Multimedia forms an important part of sharing needs of people. Different people have different sharing needs and different target audience. Though people prefer to see the feeds, not having a dedicated profile is not such a great idea. Releasing an API before actual people start engaging can make the platform a dumping ground. Lessons 1 and 5 were the most important lessons for Google. Though Google is planning to take down Google Buzz now, Google Buzz is still helping Google in a major way. Enter data liberation and Google Take out. Google is making the message loud and clear. Through this statement Google is making a statement that data belongs to the user. This will definitely make many Google+ users happy. Compare this to the Facebook's claim that not all the data that users provide on Facebook belongs to users. Google is taking this as an opportunity to promote their Google Takeout and earn few brownie points with the end users. Thats a good start. Keep going google. You must have observed all the Google services getting a new minimalistic, sleek design to have a unified design and interface, that matches with Google+. Docs, bloggers, login page, so on and so forth. Its been quite a some time since Google release the preview theme for Gmail too. Here are the simple steps to enable the preview theme on your account. Click on the wrench symbol on your Gmail account. Select theme from the tabs. 3. 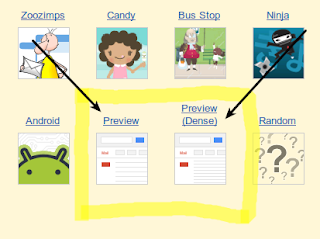 Scroll down and select Preview or Preview Dense. For any platform to be successful both the publisher and subscriber should be empowered. A platform should empower a publisher simplifying the process of content creation, content sharing and greater control over distribution. Google+ handles this very well as they have a sleek interface for creating posts and Circles are intuitive enough to make the online sharing very similar to our real life sharing. A platform should empower a subscriber by giving him enough number of choices to consume content, ability to find good content and control over what content he consumes. The first half of this statement was important in the era of newspapers and magazines. In the current era of online publishing and social networking there is so much content that is getting created the focus shifts to the second half : ability to find good content and control over what content he consumes. This is where tagging comes. I won't call them hashtags, as Google may not use hash symbol. Personally I would prefer ! as ! has always meant excitement and amazement to me. And this symbol would make more sense as people would search for and subscribe to what they find amazing and exciting. 1. !tags should get higher preference in the search. 2. !tags should be links, so when I click on !startups in a +Robert Scoble article, I should be taken to a search for the !startups which will list all the posts for the !startups with +Robert Scoble posts at the top, from others in my circles next, posts from extended circles next and then the public posts. 4. *Unsubscription model*. (All - !tag3 - !tag4 model) Ability to un-subscribe from !tags. As mentioned in 3, since there is a danger of loosing out on good posts, I would rather subscribe to +Chris Messina and un-subscribe from !family and !UncommonInterest Moreover this model will encourage careful use of tags and reduces the chances of people using !tags just to increase their findability. 5. Keep it simple Stupid To keep it simple for the non-technical crowd, the circling should be as it is now and subscribe, un-subscribe model should be built as a next layer of Circles. 6. The other potential danger is that when I subscribe to only !GoogleUpdates of +Bradley Horowitz I am not sure how many posts about !technical or !interesting I am missing out. So beside every post of +Bradley Horowitz that is appearing on stream there should be a message like (4 posts of +Bradley Horowitz were not shown to you) When I do a mouse over that message, I should get a list of !tags followed by posts for the !tag that didnt appear in stream and list of untagged posts. This message greatly helps us improve our subscription or unsubscription model continuously. So that like facebook we wont end up with the missing update problem.